The final week of the regular season is upon us and it is almost playoff time. While the season is winding down, there are still some big match-ups this week with district championships on the line. Let’s take a look at this week’s Kpreps top five rankings. In Class 6A, Lawrence remains in the top spot after surviving a fourth-quarter Olathe North rally to win 31-28. The Lions needed a 26-yard touchdown pass from Alan Clothier to Luke Padia with four seconds left to top the Eagles. Lawrence led 24-7 entering the fourth quarter, but the Eagles rallied with three touchdowns in the final six minutes to lead 28-24. Shawnee Mission East had a much easier time; blasting KC Wyandotte 70-14 to remain at No. 2. Wichita Northwest used a big second half to beat Garden City, and No. 4 Derby rolled past Wichita South. Topeka High remains in the No. 5 spot this week after rushing for 464 yards in a 34-10 win over Washburn Rural. The game of the week in Class 5A last week saw No. 1 Mill Valley beat No. 5 Bonner Springs, 48-14. Those two teams remain in the same spots in this week’s poll, and the rest of the top five remains unchanged as well. Bishop Carroll rolled to a 42-14 win over Maize South to remain ranked second. St. Thomas Aquinas remains at No. 3 this week and will travel to take on No. 4 Pittsburg to decide the District 4 championship. Top-ranked Bishop Miege was tested by Louisburg in Class 4A-I. The Stags scored with five seconds remaining in the first half to lead 14-6, but pulled away in the second half for a 42-6 win. Buhler, ranked second, scored three times in the fourth quarter to hold off McPherson 44-28. The Crusaders take on No. 5 Abilene this week. Topeka Hayden remains at No. 3 this week, while Paola moves up a spot to No. 4 with a big win over Chanute. Fort Scott drops out of the poll after slipping by Labette County, 28-25. The Tigers host No. 4 Paola this week to determine the District 4 championship. The Class 4A-II saw some change towards the bottom this week as Osawatomie falls one spot to No. 5 despite a big win over Bishop Ward. The Trojans fall just below traditional power Holton which returns to the poll after a strong district win over Perry-Lecompton. 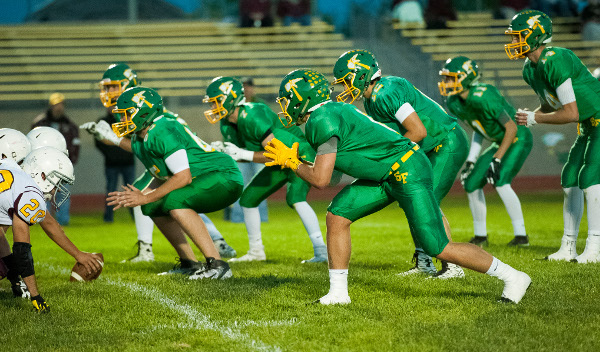 Last week’s fifth-ranked team, Royal Valley, dropped out of the poll after a 35-21 loss to Jefferson West. The top two teams remains the same this week as Columbus survived Frontenac 54-43, and Andale rolled to a 49-8 win over Clearwater. Once again, the Class 3A top five poll remains unchanged this and the stage is set for the War on 24. Top-ranked Rossville will travel to No. 5 Silver Lake this week to decide the District 4 championship. Elsewhere around the top five, No. 4 Halstead edged previously-unbeaten Garden Plain 32-28 behind big rushing nights from Layke Heimerman and Eli McKee. Halstead played without all-state running back Blake Becket due to an injury. The Class 2-1A poll remains unchanged this week as all five ranked teams posted big wins. Third-ranked Smith Center will host No. 4 Phillipsburg on Thursday night this week in a game that will decide the District 6 championship. It is also a key game on the western side of the 2-1A bracket as the loser will have to take on No. 2 Sedgwick in the first round of the playoffs. There is some movement in this week’s 8M-I top five as Solomon, ranked third in last week’s poll, fell 46-14 at home to No. 2 Central Plains. The Gorillas drop out of this week’s poll making room for Hanover and Burlingame to move up one spot each to No. 3 and No. 4, respectively. The St. Francis Indians are the new No. 5 team this week after a 46-0 shutout of Stockton. The Indians have posted five shut outs this season under new coach Rodney Yates. Spearville remains at the top of the 8M-I poll after a 46-0 blanking of previously-unbeaten Hodgeman County. There are no changes to this week’s 8M-II poll. Top-ranked Victoria did not play last week which means the Knights got another week of preparation ahead of their Week 9 showdown at No. 4 Otis-Bison. Second-ranked Sharon Springs-Wallace County and No. 3 Argonia-Attica each rolled to shut out wins, while No. 5 Axtell cruised to a victory over Blue Valley Randolph.